One of the common benefits of music education that I found in conducting the research for my book Everything We Needed to Know About Business, We Learned Playing Music was its value in developing creativity that transcends into all of ones endeavors. Creativity is like a muscle – it will either strengthen with use or wither with inactivity. My greatest concern – where will our children exercise their creativity “muscles” without music and arts education in our schools. To watch Sir Ken Robinson’s presentation on creativity and education, click here. To listen to CEOs and business leaders discussing the role of music education in shaping their careers and facilitating their success, click here. Do you believe in art for art’s sake? Me too. Music and the arts help us connect as humans and share common emotions. They can be a conduit for social change. They inspire us to see the best in ourselves, and achieve our own potential. No argument here. Here’s the problem – those who are tasked with prioritizing education funding believe in art for art’s sake as well – they just don’t always believe it’s a function that the education system should be subsidizing, at least when push comes to shove in difficult economic times. We should be able to justify arts on their own merits – in an ideal world. Here on the planet earth, it’s not working. Essentially, legislators and administrators believe that when forced to choose between worthwhile priorities, the most essential function of education is to prepare students for their careers. Art for art’s sake is an argument that essentially frames the music education funding discussion in this way for legislators and administrators – Do I fund programs that are necessary or those that are a luxury in the context of preparing students for the “real world?” Math and reading are seen as essential in any vocation, music only for the aspiring musician. We need to reframe the terms of the debate. Certainly programs will always exist that will nurture those identified as musical prodigies and develop their talents in the pursuit of music as a career. That’s not my greatest concern. The value of music education is in exposing all students to the arts and providing them with a vehicle for developing creative, diverse, and broad-minded individuals more ready for a changing world and changing workplace in any field. 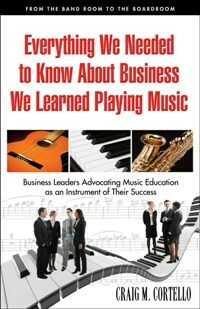 For someone who has written a book entitled Everything We Needed to Know About Business, We Learned Playing Music that chronicled the stories of 32 CEOs and business leaders articulating the 9 common lessons of music education that translated into success in business, I might be seen as a shameless self-promoter for sharing this message. Understood. The truth is that the futility of music education advocacy is the reason that I left corporate America to write the book. It’s why I have toured the nation over the last 6 months speaking to early morning television shows, radio stations, civic associations, music teachers and students, AARP chapters, bloggers, podcasters, and just about anyone who would listen. Until we start articulating that music and the arts are essential these days in preparing students for all vocations, current trends will continue. To borrow a tired phrase, “Insanity is doing the same thing over and over and expecting a different result,” or words to that effect. Let’s take sports by comparison. There are scores of current and retired professional athletes feeding Corporate America with analogies between sports and business success at conventions, banquets, and sales training events. And a sports obsessed nation of pro athlete wannabees in business suits eat it up every day. Answer this question – How is athletic program funding doing compared to music education funding these days? Don’t get me wrong – I believe in sports as a learning experience and the transcendent lessons of the playground as well. My own son has grown tremendously in terms of his self-confidence by disciplining himself to learn the skill of hitting and catching a baseball, and I’m proud to have played a role in that experience. 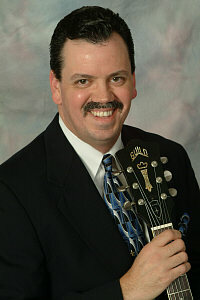 But children can achieve the same result by learning scales, playing in a band, or improvising a solo. One of my great concerns in speaking to music education associations is their resignation to the reality that music will always be first on the funding chopping block. It’s my hope that a new generation of music education students and future educators will re-energize the debate. HERE’S THE GOOD NEWS: They enter their careers armed with the reality that the sensitivities and skillsets of the artist are increasingly in demand in the workplace, even in traditionally “left-brain” industries and careers (well articulated by such author/speakers as Daniel Pink, John Kao, and Sir Ken Robinson). But it won’t happen without passion. There’s always another priority, and generally one that’s worthwhile, that will compete for music and arts education funding if you don’t speak up and let your voice be heard. Get involved, get others involved, and express your concerns – or live with the consequences.